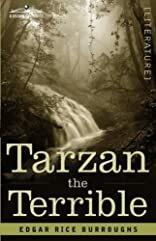 In the previous novel, during the early days of World War I, Tarzan discovered that his wife Jane was not killed in a fire set by German troops, but was in fact alive. 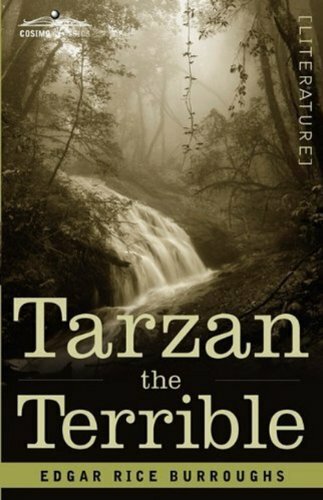 In this novel two months have gone by and Tarzan is continuing to search for Jane. He has tracked her to a hidden valley called Pal-ul-don, which means "Land of Men." In Pal-ul-don Tarzan finds a real Jurassic Park filled with dinosaurs, notably the savage Triceratops-like Gryfs, which unlike their prehistoric counterparts are carnivorous. The lost valley is also home to two different races of tailed human-looking creatures, the Ho-don (hairless and white skinned) and the Waz-don (hairy and black-skinned). Tarzan befriends Ta-den, a Ho-don warrior, and Om-at, the Waz-don chief of the tribe of Kor-ul-ja. In this new world he becomes a captive but so impresses his captors with his accomplishments and skills that they name him Tarzan-Jad-Guru (Tarzan the Terrible), which is the name of the novel. Jane is also being held captive in Pal-ul-don, having been brought there by her German captor, who has since become dependent on her due to his own lack of jungle survival skills. She becomes a pawn in a religious power struggle that consumes much of the novel.